Spring Cleaning: M.I.A. gets a Makeover this March! We’ve cleaned out our closets and shaken out our sheets, meaning more space for more bodies! Okay, that may sound a little morbid, but what we’re trying to say is that the M.I.A. 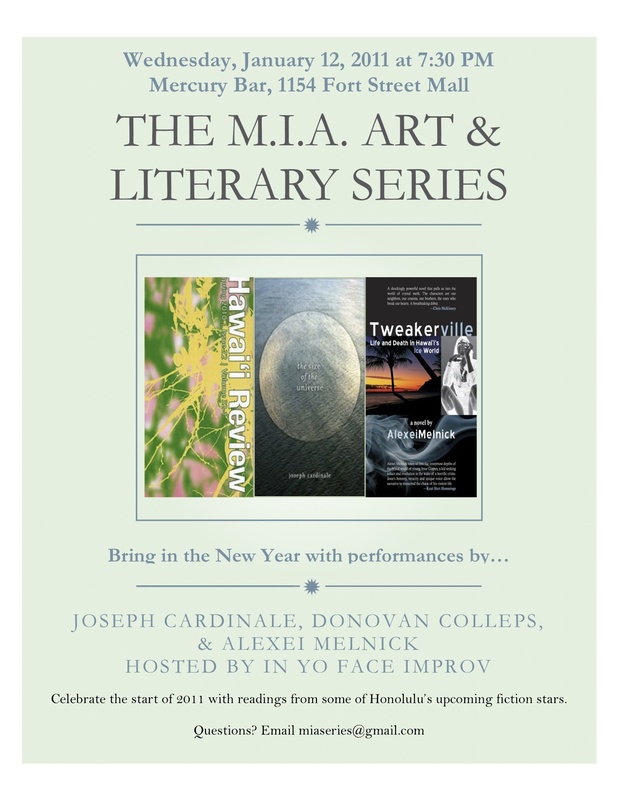 Art & Literary Series has been a such a huge success since its launch into the Honolulu Art Scene in October of 2009 that we need more room! So we are moving to the spacious Fresh Cafe where the stage is large, the space is wide, the food is gourmet, and the bar is open for business. This venue, if you’ve never been, hosts great events like Art & Flea, Fresh Market, Girl Fest Hawaii, First Thursday Hawaii Slam, IYFI, and more! So what’s different about M.I.A. these days, besides Fresh Cafe? TIME: We will be starting at 7:45 pm, but get to Fresh Cafe a little early so you can snag a seat, a drink, and a delish sandwich. AGE: That’s right! You no longer have to be 21+ to see the amazing performers at M.I.A. events. The show is all ages which opens up tons of doors for both audience and performers. We welcome you, no matter how young or old you look–but bring your ID so that we can stamp you appropriately at the door. SUGGESTED DONATIONS: M.I.A. will always be free. However, as we grow, we need more funds to advertise for our events as well as work towards bringing in people from areas outside of Honolulu. Donations go to PR, advertising, honorariums, and so on. So our policy is PAY WHAT YOU CAN. If this means throwing us a couple bucks every now and then, cool. If you can give more than that, no one is going to stop you either. So be generous if you can, but no pressure. If every guest paid $1, M.I.A. would be thrilled. So thrill us please. We dare you. With all these great changes, what’s the same? Fabulous Performances, great drinks, and a damn good time! 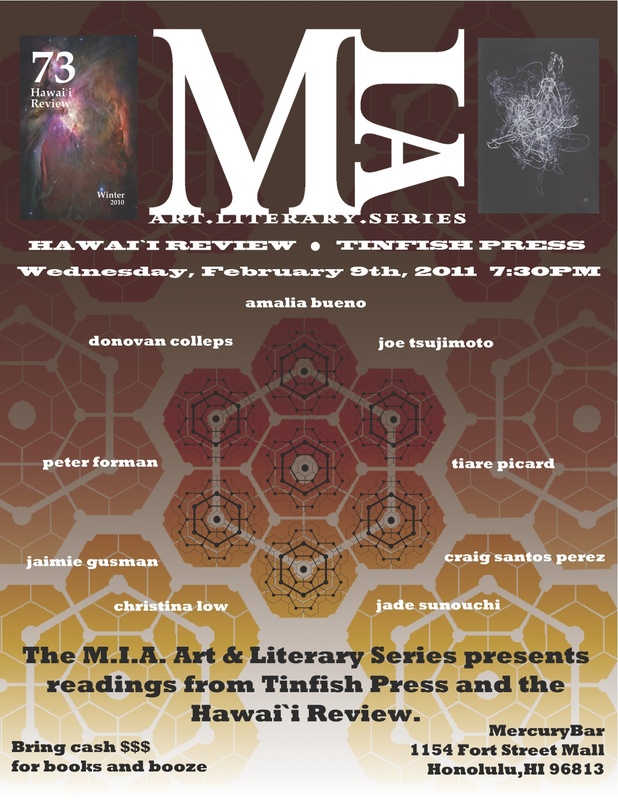 Dawn Sueoka is a stellar poet and avid M.I.A. attendee. We are so happy that she will grace the stage with with her verse! Check out her style here. This month we have Janine Oshiro (her book, Pier is coming out by Alice James Books) who will read her stunning poetry. Get a preview of her work here, and read a great interview here! When she isn’t working, studying, teaching, sleeping, or killing vampires, you can find Rachel Wolf writing fantastic fiction. Don’t miss out on this opportunity to hear Rachel read new work! Your hosts for the night will be In Yo Face Improv, bringing the funny to the stage. 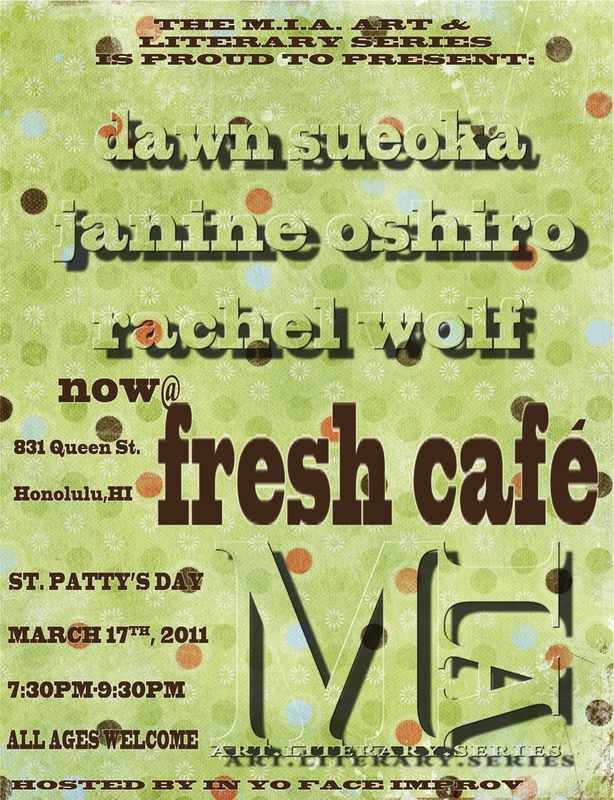 We hope you’ll all make it to our new location on March 17th at 7:45 PM at the Fresh Cafe. Author MIA HonoluluPosted on March 2, 2011 March 3, 2011 Categories UncategorizedLeave a comment on Spring Cleaning: M.I.A. gets a Makeover this March! Hawaii Review meet Tinfish Press, Tinfish Press meet Hawaii Review. These two local presses are powerhouses in the literary landscape of Oahu and way beyond waters. On their website, Tinfish Press states, “We publish work from the Pacific region, concentrating on language issues, colonialism, Buddhism, place, and poetic form. Above all, we seek to create alliances between writers whose work crosses national and aesthetic borders.” If you have not yet viewed one of their lovely books or journals, be sure to snag something at the M.I.A. February event. “Founded in 1973, Hawai’i Review is a student run bi-annual literary journal featuring national, international, as well as regional literature of Hawai’i and the Pacific,” and as current poetry editor I can vouch for the quality work in the new issue, 73, which you can purchase at M.I.A. To find out more about the Hawaii Review click here. If you have not heard these masters of craft before, please do stop by the Mercury bar on February 9th, at 7:30 PM. Bring cash if you would like to purchase some journals & books (they make great Valentines, yes sir!). Hope to see you all there! Feeling Nostalgic for January’s Event Already? A big shout out and thank you to MALIA LEINAU MYERS (awesome photographer and person, by the way) who trekked over to the Mercury Bar this past Wednesday night to cover the event. She was a trooper and hung out, taking tons of pics, for every reading (which happened to be accompanied by a roof-shaking punk/metal hum coming from the artist studio upstairs). But despite the noise–we had a great turn-out and everyone seemed to have fun. Scroll through all 23 photos on Honolulu Pulse, the Honolulu Star-Advertiser’s event-site, or just click here if you want to see what you missed. If you were there, chances are Malia photographed you, so check it. Stay tuned for February’s event, which will (as always) be the second Wednesday of the month, at the Mercury Bar! Author MIA HonoluluPosted on January 14, 2011 Categories UncategorizedLeave a comment on Feeling Nostalgic for January’s Event Already? It’s hard to keep up with all the great literature being written in Honolulu. Luckily, the M.I.A. Art & Literary Series is here to pull you up by your slippers and drag you out once a month for a night of good booze and good performances by local artists. This month we are proud to have three strapping young men grace us with their presence. Alexei Melnick is the author of Tweakerville, which the Honolulu Weekly called “the real thing”. Read reviews of Alexei’s book here and here, and then come hear him read on Jan. 12th. Joseph Cardinale is the author of The Size of the Universe, which HTMLGIANT reviewed here. Cardinale’s work can be read at Web Conjunctions. It’s awesome and he’s awesome. So come to M.I.A. and confirm his awesomeness. Donovan Colleps is the Editor-in-Chief of the Hawaii Review. The new issue will be out soon, and yes, he will be in it, which we don’t think is weird at all. Donovan is a cool person and looks really young for his age, so you’ll definitely want to hear him read. The night will be hosted by Chris Riel of In Yo Face Improv. So be prepared to laugh. A lot. (No pressure Chris!) IYFI is awesome, and if you come by M.I.A. you’ll learn how/when/where to see more of Chris & his funny friends. Looking forward to this event, Wednesday, January 12th @ the good ‘ol Mercury Bar conveniently located in an alley in Chinatown. Address on the flyer. Hope to see you all there! you thankful for this year? M.I.A. 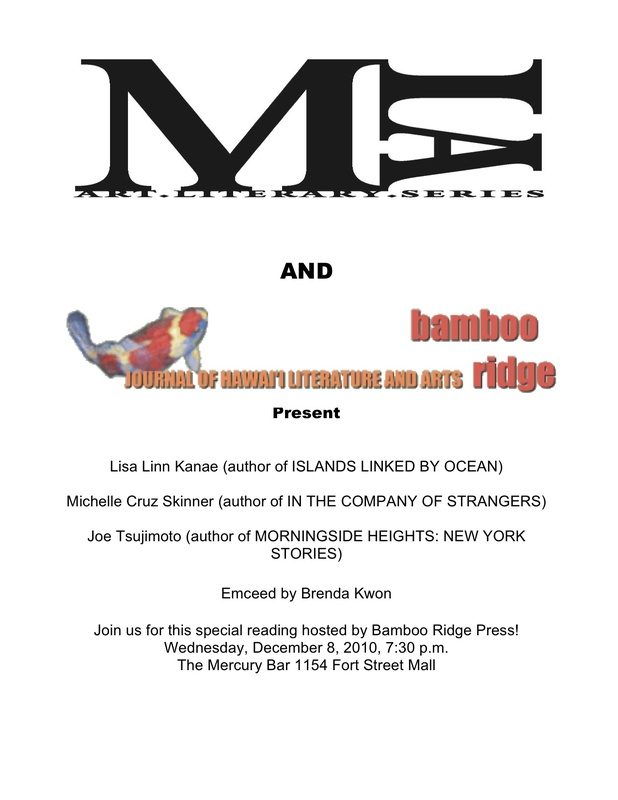 Art & Literary Series will be held on November 10th, 7:30 pm, at the Mercury Bar. Come join us, you’ll be thankful you did! Author MIA HonoluluPosted on October 30, 2010 Categories UncategorizedLeave a comment on What are you thankful for this November? 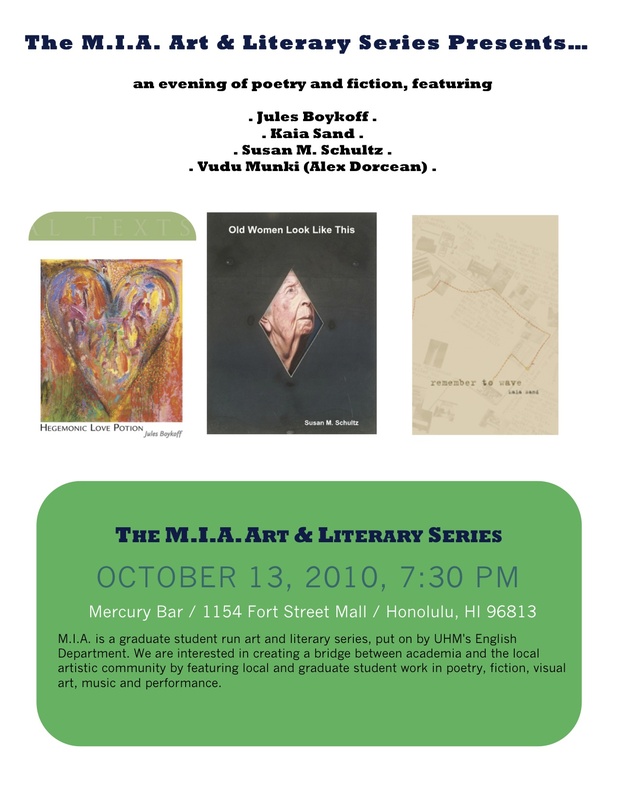 Come get drunk on literary goodness (and have a drink or two, too) on October 13th at 7:30 PM, at our regular spot, the Mercury Bar: 1154 Fort Street Mall, Honolulu, HI 96813. Author MIA HonoluluPosted on September 18, 2010 September 18, 2010 Categories 2010 EventsLeave a comment on October brings Oregonians!